Is there an available gerber, .dxf or other mechanical/mcad file detailing the component holes on this pcb? Correct me if I'm wrong, but it looks like the board layout is not public? I bought a board from SmashTV so I don't strictly need the board file (although it would be simpler). I'm engineering a snap together case so i'd just like to base my design on the most accurate dimensions available. My goal is to model the pcb and make a CAD assembly including switches, mounting hardware, etc, and make a front panel based on the component footprints. I'm happy to share my work for people who want to use different switches, they would just need to change the model of the cap used and the front panel would recalculate the dimensions based on the new model. I can copy/paste from Seq1 to Seq2 no problem. But if I have a 16 step pattern in bar 1, Is it possible to copy/paste to bar 2, and then change the length to 32 steps? Or is this sort of functionality achieved in a different way? Edit: for clarification, I'm looking to record a 1 bar pattern, and duplicate it to bars 2,3,4, so then i can add different notes to the different bars. It would be possible with the big brother MIDIbox SEQ V4 (without Lite) since the UI supports this - but the handling requires a LCD and GP encoders to shift the copied range to the new position. It isn't possible with MBSEQ V4L, and no, I won't add a special (difficult to remember and therefore never used) button combination. Thanks TK, I can see how that is not the intended use case for the lite. And sorry if It seemed like I was asking for a new custom feature that only benefits me - I've never had a sequencer like this before so I'm still learning how to do things! 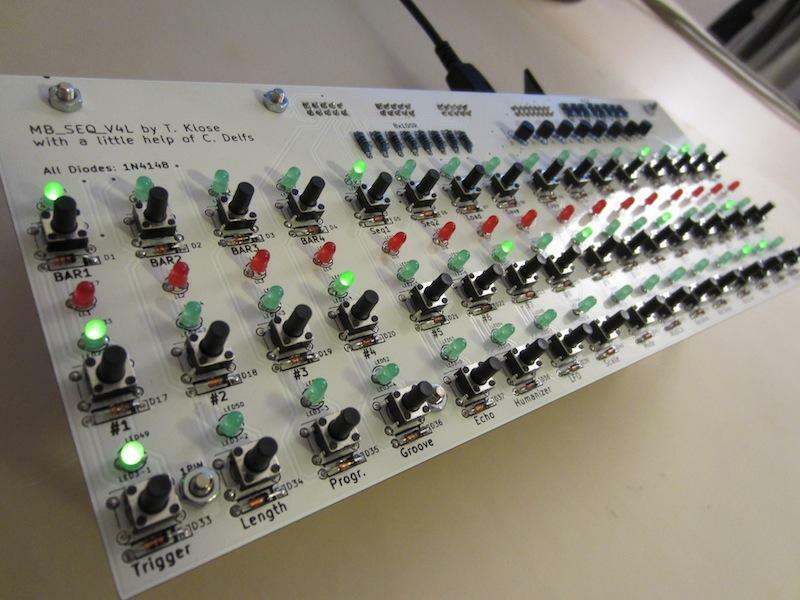 Does anyone have gerber flies of this MIDIbox SEQ V4Lite board? Or, maybe, where I could buy it? It used to be available at SmashTV's MIDIbox shop - not sure what the current status is, it is currently not listed there. Maybe you just send him a message and ask directly? I've got two V4L frontpanels that I don't use anymore. If you can't find a PCB and don't mind getting one that's already completely soldered, I could sell you one of mine. Both have minor problems with a couple of the LEDs not lighting, but otherwise work fine. I'm trying to get a program change midi message to pass through my SeqV4L using Abelton Live, but it's not happening, all 4 SeqV4L ports show up in Abelton, and note values/timing clock do pass through. I've tried sending on all midi channels, only thing I see on the Midi-Ox at the other end is a pitch bend, any thoughts of what I might be doing wrong? I was trying to pass the PC through the LPC_1769 core, USB --> midi out, not record it, like a midi interface does. @ all: You need a vector based graphics program to work with the files I provided. This is not a ready-to-order-file. It is a cool basis to do what you want to do. So, as mentioned before you need Adobe Illustrator, Corel-Draw or a similar programm. If anybody knows a really good working freeware tool to handle SVG-Files, please be so kind and let us know. I'm always in a lack of time so I'm not able to provide a file for a closed case wich is ready to use at the moment. As soon as I have a few minutes left I will do that. What I have here is the original SVG File wich I took as the basis to built my acrylpanels. Maybe this is helpful for any one of you. This SVG file was exported from KiKad, wich is the layout software I used to make the board. Hi, sure that is 1:1 if i load the svg in corel the dimension of the front is 202,5x82.5mm, the pcb herself had dimension 250x100mm ? sorry, back for a long long time. i lost the link to the actual or latest v4l firmware, where can i find it please ? i have an old one on mine. Is anyone still alive on this forum? before but I did not get any help. It's the same basic layout as before, except that the shift registers are on board. This means only a single ribbon connector to the Core is needed = easy wiring. or could we feature-creep an LCD/OLED in? Accordingly there are some pullup/current limiting resistors added, but the 595 should be able to sink the cathode rows without transistors. 3* SOIC16 chips, 3 1206 caps, very easy to solder! The remainder is THT. Expansion header e.g. for DOUT gates etc. I adjusted a few labels, like changing Tempo to BPM to be more consistent with the SEQ, Program is spelled out fully it's progression isn't it? and Record modes are factorised. It might be possible to add another switch footprint, so tell me if there's a particular switch you'd like to use and I'll see what I can do. I won't consider the TL1100 series because they exhibit serious problems with reliability after a year or two. 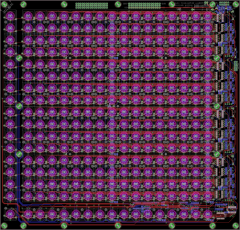 As long as there's interest I'm happy to do a PCB run. 6mm switches (4.5/6.5mm lead spacing) are now implemented with a 1.5 1.6mm vertical offset relative to the D6s. Any others? Prog. and Tempo labels reinstated. is the seq supposed to reload patterns while playing? On my unit when I load another pattern while it is a MIDI slave the SeqV4L gets out of sync and runs a step behind the other tracks. Yes, this should work fluently w/o hick ups. How can I reproduce this - which setup are you using? Final PCB design labelling. I added some helper labels like what each "track layer" does, scale types per GP button, keyboard notes (transposition) and dividers for tempo. If there's no further suggestions I'll probably place the order within a week. But from my point of view, the additional labels, and also the SEQ1/2 lines, are more confusing than helping. They are above LEDs which don't belong to the appr. functions. It would be better to remove them. Thanks for checking, to clarify do you mean just the extra labels on the top of the board or scale/note/divider as well? I mean all helper labels. Scale selection labels below above position LEDs: don't belong to these LEDs, they belong to the GP LEDs when the Scale page is selected. I'll try to explain what I meant. The labels are not intended to indicate LED function but instead give the position of the GP button to press when in certain modes. For example, I wouldn't immediately remember an Ionian mode was on GP#14 when selecting a scale, nor a quick selection of 1/16T for tempo/divider on GP#11. The notes are directly associated with the GP button, maybe we could even consider a "303" type of note entry recording with them. For me, the clear, tempo, scale, and mute functions are the least intuitive, but I haven't built nor used a SEQ V4L, so I can't say how quickly one learns these off by heart in practice. As we've discussed before, some people are more adept at menu programming than others :). I agree that the top positions are the most separated from GP buttons, and probably not too hard to memorise (I'm sure they'd be welcome for debutants though :) ). Does this make more sense? I know for my own case I would rather have these labels than not. I'm aware of your intentions, but it doesn't work for me. Putting labels at the wrong place leaves a very bad user impression. It's a no-go for a good frontpanel layout. It's clear that you intent to add them as a reminder for GP button assignment, but not there! For learning purposes somebody could just print out a template and place it over or under the device, but later he won't need it anymore (or only if he didn't use the device for a long time). Btw. : the labels will also reduce flexibility for future improvements. In the end I've ordered PCBs with the top "track" and scale info labels removed. I kept the note and divider labels. They're minor functions with much smaller size than the "main" labelling of GP/function buttons, so not very intrusive IMO. They're in the "right place" and I doubt they will become obsolete, especially as you've said you're not actively developing the V4L much further. For the suggestion that because everything can't be labelled explicitly, no function should get extra labels, I humbly disagree. Looking through the V4L user manual, many modifiers such as groove/delay/humanizer are intuitive as the "amount" is proportional to the GP button pressed, so you'll know exactly what you're getting. The other four I mentioned are quite confusing without a guide (paper template... hmmm) and are "critical" functions when performing live to maintain timing or pitch. The "lite" version of the SEQ is meant as a lower cost version of the SEQ, and an even lower cost is achievable with a transparent case. Some might find the PCB labels annoying or sub-optimal, or might not even like the colour of the PCBs (will be yellow/black )! In this situation, they're free to design their own opaque case with custom labelling. I'm looking forward to the PCBs and a new direction for SEQ V4L.